The repair of structural timbers in historic buildings, and especially churches, along with buildings in general can be demanding and controversial. In historic / listed buildings any timber repairs found to be necessary – usually as a result of wood-boring insect infestation and / or wood-rotting fungi – require a good understanding of the principles and techniques involved, in order to effect a suitable repair strategy. Any repairs undertaken should successfully restore the structural integrity of the timber framework, along with satisfying complex aesthetic and historical requirements. Never easy, or straightforward! Quite often, large, structural timbers in historic buildings will have been hand worked, or salvaged from earlier work and re-used during the original construction, or in a previous restoration. The choice and type of repair needs to take into account the character and the age of the original timber to be repaired. When dealing with large section, structural timbers, it should be sympathetic to the actual building itself, as well as to the repairs that may have previously been carried out during historic work. All contribute to the historic interest of the building’s fabric. In other buildings, which are not listed, or classed as historic, the principles remain, in that any repair to structural timbers such as joists, rafters, truses, beams etc. should ensure those timbers retain their structural integrity. Effective timber repair – whether with traditional or other methods – needs careful investigation, specification and execution. Depending on the type(s) of repairs necessary, any decisions will often be taken after consultation with an independent Structural Engineer. The choice of repair will depend largely upon discussions with the client, their builder, Surveyor etc. and the approach being taken to each individual project and whether a decision has been made to repair, restore or conserve. There are many ways of repairing timber structures and sometimes a mix of repair types may be appropriate. When carrying out a repair using timber it is important to select material of the same species, preferably from a reputable source and, most importantly, with a moisture content which matches to within one per cent that of the timber being repaired. Once again, very important where structural timbers are being repaired. If this condition is not met, the different drying rates of the timber may cause problems with the repair joint. Very often, where like-for-like timber repairs are the preferred option in an historic building i.e. scarfe joints etc. it is best to use a local builder / carpenter who is experienced in this type of work as they will know where to source the correct material and will be experienced in the complexities of carrying out these repairs. When deciding on whether to replace a complete structural member or not, it is important to take into account the perceived life span of the particular timber. Replacing an entire beam can entail significant logistical problems and complex access issues which need to be overcome. As you can appreciate, such an operation can be very expensive. 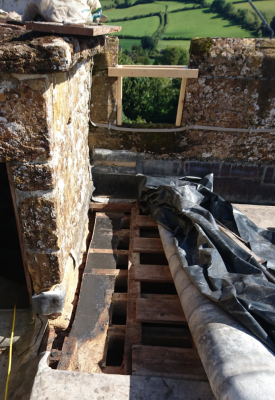 Owners of historic, timber framed buildings will undoubtedly have seen repairs which have been carried out using steel plates, large steel bolts, bricks, cement and mortar. Mostly, this is because that is the type of material available at that time. Some of these repairs have probably been in place for many, many years and, may well stay in place for many years to come. Where this is the case, why change things? One of the obvious problems we see where bricks, mortar, etc. have been used to fill voids in decayed hardwood timber is gaps around the repair joint and this is largely because the mortar has lost it’s key against the timber. Remember, timber will expand and contract as a result of moisture ingress and this movement will result in cracks around this sort of repair. This can – and usually does – allow water ingress around the old repair, which, in turn, results in decay continuing within the core of the timber. Sometimes controversial, is the use of resin for structural timber repairs. However, prejudices often stem from a lack of knowledge and understanding of this technology, which can provide a very cost effective repair. In order to proceed with a resin repair certain justifications may be necessary, in order to convince interested parties of the suitability of this type of repair in a particular situation. Perhaps the most common example of its use is for replacing decayed beam ends and also, for repairing decayed joints in vertical timber framing (externally or internally. Simple beam ends can be partially or entirely replaced by cutting away the infected timber, inserting reinforcing rods into the timber ends and pouring resin into a pre-formed mould box, thus re-forming the original profile. Cracks and fissures in timber beams which can threaten their stability but more often, are unsightly, may also benefit from the use of resins, as they are rarely deep enough to warrant more drastic measures. Longitudinal cracks caused by drying over the years may be simply repaired by drilling vertical holes at right angles and through the fissures at appropriate centres; rods can be fixed into these pre-prepared holes with injected resin into the fissures. Reinstatement of the shear transfer of the upper and lower section of the beam is thereby restored. 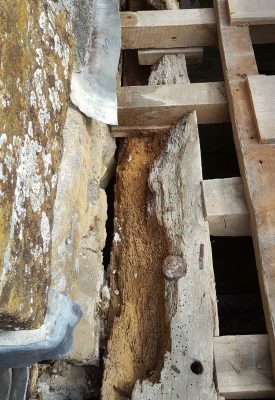 Another common problem which can benefit from the use of resins is the loss of a significant cross sectional area of a timber beam due to fungal or insect attack. In many instances the decay is confined to a relatively short section of the beam and does not warrant wholesale replacement which could be both complex and expensive. As mentioned, although there can be prejudice against resin repairs, there is no doubt at all that this method can – and does – create a very strong and economical repair, when compared with traditional timber repairs and / or timber replacement. Before any type of resin repair is considered, it is important that a thorough inspection of the affected timber is carried out before repairs are specified. Following which, the suggested repair method is discussed with the property owner or their representative, building contractor, surveyor and / or engineer so that an agreed programme can be proposed.